I had promised Bran Muffins with Apple Syrup but the recipe is a work in progress and not quite ready to upload – they taste nice but they look sort of brown and boring. And if they don’t look pretty enough, who will be inspired to make them? We’ve had three batches of 30 bran muffins and the Mopp is eating them as fast as I can bake them. I did try to freeze a couple of containers but they have been retrieved from their secret hiding place and scarfed down too. I kind of wonder if Mopp is sabotaging the recipe slightly so I have to keep trialing the recipe – that way he keeps a never-ending supply of not quite perfect muffins coming his way. So for this post I turned to plan B. With the advent of my new apple research project, I now have an apple-dar or if you will, an apple radar. I spot all sorts of products containing apples in some way and so our pantry is slowly filling up with interesting appley products. I have trained my assistant grocery purchasers quite well too as the Anster came home with a bag of Smitten apples thinking I won’t have heard of them before. Hadn’t tasted, but had heard. We are a big muesli family – not big as in big fat though some are big tall, but we eat a lot of muesli. Lots of homemade muesli and occasionally demand is higher than supply so boxed cereal fills the gap. My apple-dar noticed that while a lot of cereals have berries or apricot, there are also plenty with apples. 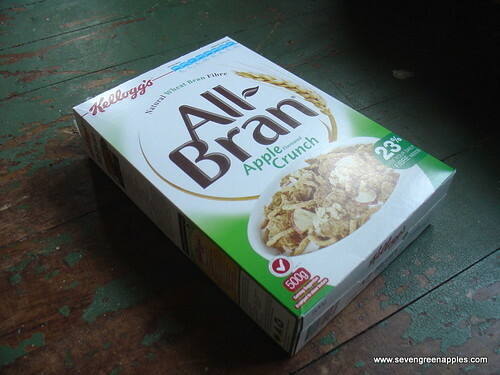 I loaded up the trolley with some Kellogg’s All-Bran Apple Flavoured Crunch and some Be Natural Cereal Pink Lady Apple & Flame Raisin. My thinking was the All-Bran would be safe from the muesli-munchers because what teenagers (and almost-teenager) would eat All-Bran? So that box was placed in the pantry – that was my first mistake. The second box was hidden in my bedroom – who would think to look for breakfast cereal in the wardrobe – right? 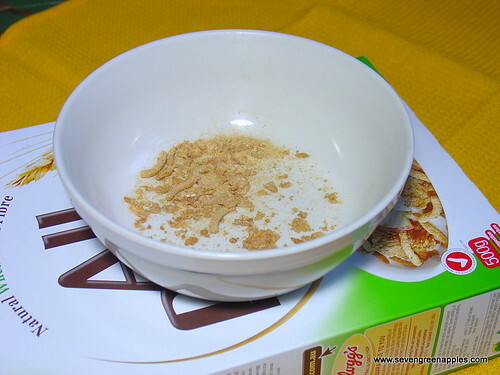 The Mopp had munched his way through the our stash of Sultana Bran – ultimately the best cereal in the world in our house – I have to ration one 750g box per week otherwise they’d eat the lot within two days of it arriving in the house, doesn’t matter if I bought one box or three. So when I was politely asked if he could ‘try’ the Apple Flavoured Crunch he had spotted on the top shelf (I hadn’t even bothered to tuck it behind the Weetbix I thought it was that safe), then happened the second mistake – I said yes quite forgetting that ‘try’ most likely meant inhale the whole box. And in absence of plan C, I decided to carry on regardless and post an almost empty plate of cereal in testament to the lovely apple flavoured cereal that my fifteen year old Mopp polished off. If we hadn’t just had a gorgeous meal of roast lamb with roasted potatoes, kumara and pumpkin, I’d consider preparing a large bowl of the wardrobe-dwelling cereal, yoghurt & blueberries so I can take my photos then force feed the Mopp as his punishment. Except I am not so sure that he would consider that a negative, more like ‘cool, mum’s made me some pudding’. 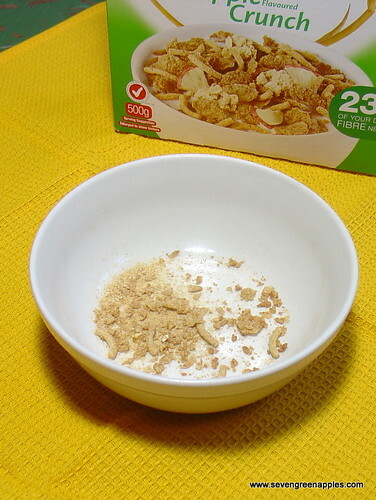 Footnote: a more suitable punishment – I bought another box of cereal and managed to save a bowl-full before it disappeared once again. Placed in a prominant place on the kitchen bench is said bowl (still full) tightly covered in plastic wrap. Every day the fifteen year old cereal hoover asks if I have taken the photo yet…..and every day I smile and say not yet. 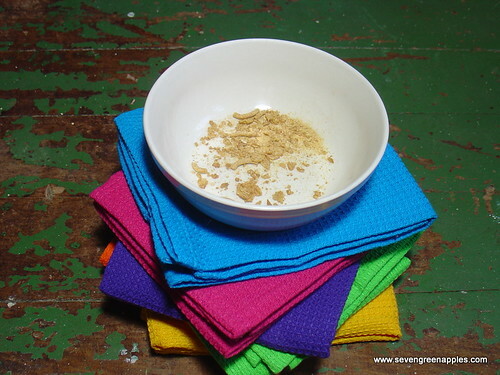 This entry was posted in Product Review and tagged breakfast, cereal, muesli by Jo Dohrman. Bookmark the permalink. You write really well – made my laugh out loud several times! Keep up the awesome posts.